Friday’s shooting star candle on the daily silver chart made it three in a row and reinforced, from a technical perspective, the bearish sentiment currently in place for the price of spot silver. With three such consecutive signals of weakness it would seem likely that silver prices will follow gold lower today and the only question remains is the depth of any such move. 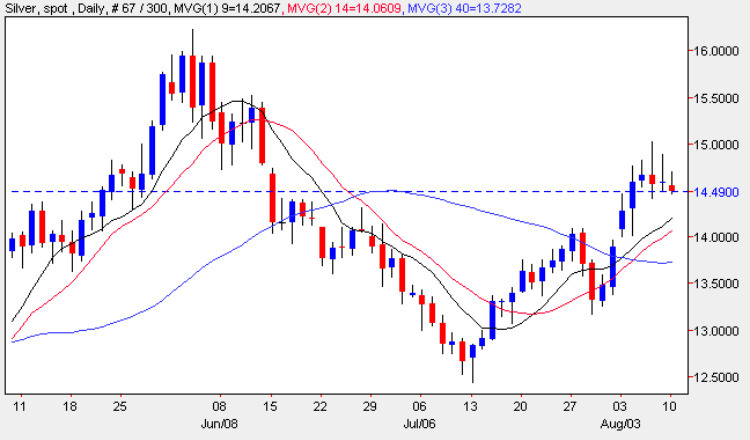 This decline in the price of silver may be relatively short lived as the weekly chart is still presenting us with a positive picture with the weekly close holding above all three moving averages. The first level of support on the daily silver chart is now coming into play in the $14.25 per ounce level and should this be breached we could see a drop to the price band at $13.85 per ounce. Should this price level fail to hold then we could see an even deeper move back down as far as $13.50 or below, particularly if the price of silver breaches both the 9 and 14 day moving averages. The correlation between gold and silver prices failed to hold on Friday with gold falling significantly whilst silver managed to contain any losses. Part of the reason for this is silver’s use as an industrial metal which should therefore benefit from any positive moves in equity markets as the recession/depression begins to recede and risk appetite returns once again. The short term is bearish, the medium term sideways & the long term bullish.